This is a summary for McKenna ages 6-7 weeks old (the seventh week). This was a really nice, smooth week and was my favorite week so far. McKenna became much more interactive and initiated smiles. She became far more alert during waketime. Things all went smoothly and she dropped a nighttime feeding. All was splendid! I wanted to give a gripe water note. McKenna gets hiccups all the time. Up until a week ago, she got them during every waketime. She got them after every middle of the night feeding. Happily, I can just lay her in bed with her hiccups and she goes to sleep, but I still hated to see her with them. You read in baby books that hiccups don’t bother a baby. Really? How do they know? Anyway, each time McKenna gets the hiccups she groans for the first few. No matter what the books say, I can tell they bother my baby. The recommended dosage on the gripe water for her age is 1 teaspoon. I just give her 1/4 teaspoon and that cures it. Nursing is the same. Nothing new to report. Waketime was also the same. We didn’t do anything new…except I guess that she smiled at me spontaneously a lot, so that is always fun! Naps continued on as normal and needing to be woken for most feedings. I totally stopped the “sitting” part of the four S’s (see: Sleep Training: The Four S’s) and she did just fine. As I said in the opening paragraph, she dropped a night feeding! It was exciting. She started waking more around 3 AM and then around 6-6:30 AM. This isn’t my ultimate 7-7:45 goal (I will be happy with any time in that range), but it is late enough I am happy with it. Babywise says there are several ways you can address this waking early issue. For me, anything before 6 AM is a night feeding. Anything after I will take as a day feeding. I am willing to have a 6:15 waketime for a while until she can sleep longer. I can move it back later when I need to using my time change strategies (see Time Change Strategies: http://babywisemom.blogspot.com/2008/02/time-change-strategies.html). You do have to be careful with this, however. You might start a habit that is hard to break. See this post for more on these early morning feedings: Early Morning Feedings Before Waketime: http://babywisemom.blogspot.com/2008/01/early-morning-feedings-before-waketime.html. There is something strange we noticed this week. McKenna seems to be able to sense when I am not home. I know it sounds crazy, but it is true! When I am not home, she wakes early OR she won’t go to sleep. Kaitlyn was the same way when she was a young baby. Am I crazy? Did this happen to anyone else? I honestly don’t think I ever left Brayden when he was a young baby, so I never noticed that with him. Emotions were a non-issue for me. I don’t anticipate them becoming an issue again, but if they do, I will fill you in. My yeast infection seems to have gone away. I am not holding my breath, but for now it is gone and there are no problems from it. Next Post Poll Results: Did your baby experience the 45 minute intruder around 7-8 weeks old? haha – I’m not sure I noticed Mary acting different when I wasn’t home, but for a while I could SWEAR she knew when I woke up in the morning. I know it’s ridiculous, but I’d try to wake up early to read (not even getting out of bed, so I know it wasn’t that noise woke her) and she would wake right up, but if I slept…she slept! Crazy. Hi- my son is 14 months old and he hasn’t taken an afternoon nap for 2 wks now. He still goes down for his morning nap from 10-1130 and I still lay him down for his second nap around 230 but he doesn’t sleep, he just lays there for 45 minutes they starts screaming out for me to come get him. Could he be ready for one nap at this age? I thought it was too early but I hate the unpredictability of his current schedule. thank you!! Awesome! I hated the hiccups too. I am so glad to know this about gripe water! Thanks for sharing, I often read your blog and love what you share here. I just wanted to tell you how helpful your blog is. I found it while googling when my son was probably 5 months old, but I wish I had known about it even before he was born. (He is now 15 months) The babywise series is wonderful, but I find that the books are way too short and I was left with so many questions after I read them. You really fill in the gaps with your blog. Thank you so much! Hi! Thanks for sharing….my son is 6 weeks old too (however he was born 4 weeks early). I’m having a very difficult time getting him back to sleep in the middle of the night. With my daughter I would feed her and lay her back down and she would sleep. He doesn’t. I feed him at 11 p.m. and lay him back down and he sleeps until 2:30ish….after that he usually cries until 3 or 3:30. Do you have any hints? Also, I let him CIO, but don’t remember it taking so long with my daughter. He can cry up to 1.5 hours. Thanks ahead of time for any help. WOW! That happened to me. When my docter said I was ready to exercise again, that was at about 6 weeks I usually went when she took her last nap before bedtime. When I was home she slept perfectly, when I went to the gym my husband was home. Everytime I came home from the gym she was awake, early. I then just put her back down to finish her nap. We thought that it wasn’t possible for her to sense that I’m not there. But after reading this blog I believe that they can feel it. :)Now at 9months she goes with me to the gym, because there is a krech facility in the gym and I think it is good for her to be around other children for 45min a day. Its like sibling playtime but just not with her siblings. And she loves it.I want to thank you for all your blogs.About two weeks I fell rock bottom. She still only takes 45min naps. I bagan stressing about it alot, and I think she felt it because she was very fussy and cried more than usual. That day was one of those days that she just didn’t want to sleep.And resulting me trying to force her to sleep and that only resulted to more crying.My husband came home and then I just got out of control, I ran outside and threw a big tantrum cried and felt sorry for myself. (I try not to cry and get mad in front of her) So at last (thats how I felt most days) she was in bed for night time and I was alone. I then did what I whas suppose to have done a long time ago: Ask God what I should do-:) And no suprise, He told me. I just got this words in my head “chronic 45minute nap” I remembered seeing it months ago but didn’t bother reading it because at that time it didn’t apply to me.Sigh of relief!!!!!!!!!!!!!!! !I’m not the only one!!!!!!!!!!!! The next morning I decided to go with it but not giving up on trying to fix it.It went better emmediately, she was more relaxed, I was more relaxed and my husband was more relaxed.So I decided to keep a log again. So I read through the two week log and saw the few times that she did sleep longer that 45 min, and saw that she was awake very longer than usual. Yeterday I dicided to try it. The mornings she was usually awake for 50min and in the afternoon for 1hour and 45min. I tried 1hour and 10min in the morning but it didn’t work. The afternoon I tried 2hours and 27min and it worked she slept for 2 hours. yeeeeeaaaahThis morning I wanted to try 1hour and 30min but something told me to start with 1hour and adding 5min everyday from there. But luckily I didn’t have to because she slept for 1hour and 45min.I am happy that the naps is working out but I am more happy that we can enjoy each other again.I just wanted to share my experience. Thank you.Because of your blog my prayer was answered. Jon- 1hr 15 mins may still be too long of a wake time for your six week old. She may be getting over stimulated and having a hard time settling in for a nap. This could also be what’s causing her to wake earlier. He talks about this in babywise and recommends putting baby down about 15 minutes earlier. I know it sounds crazy that putting your baby down earlier would help her sleep longer, I was skeptical about it at first, but when my son had the same problem, that’s what we did and it helped a lot. I’m pretty sure there’s a post here about this too. We started CIO at six weeks, going in every ten minutes or so. We used the pacifier as part of soothing him. At first, he would sometimes struggle his entire nap time, but within a couple of weeks, he started to really get it and would fall asleep right after the first soothe.Val, when my son was in his first couple months, I caught on that he could sense when my husband was home. My husband was less patient about CIO and would often “rescue” baby from his naps. So whenever he was home, my son was way more persistent with his crying. This was the case even if I had put him down and he hadn’t seen his daddy. thanks Jen…it’s just nice knowing that he’s just like other kids. I have a friend with twin boys and they didn’t give up their nap until 18 months so I felt like I was just getting it wrong. Hi, my daughter is 8 weeks old and used to nurse 15 minutes increasing to 20min. a session, but the last few days has just about fallen asleep almost every nursing session and now eats 12-15min. long….which resulted in her waking 45-60min. after I put her down for a nap (I’m assuming it’s the 45min. intruder but it’s hard to tell when she isn’t taking the normal full feedings anymore) I do all the things (cold washcloth, tickling feet etc.) to try to keep her awake, but I can’t figure out why she’s so sleepy in the first place, especially since she sleeps 6-8hrs thru the night and only wakes early from naps once or twice a day? Any thoughts? Hi- I’ve been doing babywise with my son since week 3. He’s fluctuated between a 2.5 hour and 3 hour cycle. ( currently 2.5 hours ) He wakes up at about 5:30am and naps for about an hour each 2.5 hour cycle. He’s great during the day, goes down easy for naps, very predictable! He goes to bed at 8pm and that’s where the trouble starts. He’s 13 weeks and he still wakes up between 12am-2:30 am and sometimes at 4am as well. (I do let him CIO for 10-15min- but if he does go back to sleep it’s only for 45min to an hour. )It’s frustrating because at 5 weeks, he was sleeping 12am-6am!!!! I’ve tried DF, but it was causing him to wake up every 3 hours all night! BW has been so wonderful in terms of scheduling, but he just hasn’t caught onto STTN! Any troubleshooting advice would be appreciated! Lubbers, that is funny. I don't know how she can tell, but she does it! She seems to be getting over it…or at least she is fine later at night when I go running. Reds,It is possible. BW says from 14-22 months is when it will happen. I would either shorten the morning nap or try dropping it. You are welcome Jasmine! I have found the Baby Bliss brand to be better than the Little Tummies brand (those are the only two I have tried so far). Erin, Thanks for the thanks! I am glad it has helped you out. 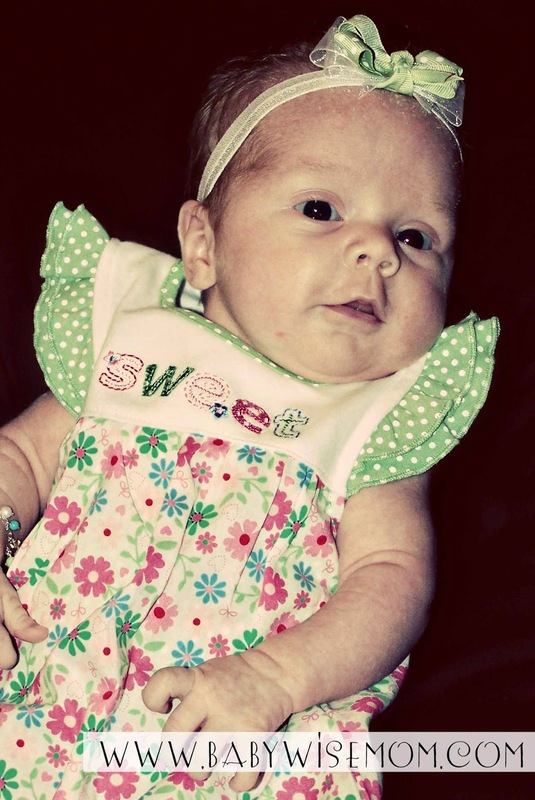 Bella, McKenna was born 3 weeks and 1 day early :)I am sorry…I need clarification (if you are still having trouble). Are you saying he sleeps until 2:30, then you feed him and he cries, or you don't feed him and he cries? Jon, it can be as early as 7 weeks and as late as 12 according to the book…according to what people experience, it can be even later in age.Personally, I say wait until 12 weeks before considering CIO in the night. Some people just know baby is ready earlier. If so, you are the parent and know your baby. But if you have any doubts, wait until 12 weeks.For a 6 week old, that is probably too long of a waketime. Even now, a few weeks later, that is too long for the vast majority of babies that age. If she is having a hard time, it is most likely too long of a waketime. As to the waking early, 6 weeks is a common growth spurt time. If it isn't a growth spurt and you breastfeed, it is a time when your hormone levels drop. Some of those hormones stimulate milk production, so babies often need to nurse more often to encourage milk production (not forever, but for a bit–no exact number of days 🙂 ).For CIO, I would say that is up to you to decide. Age wise, many babies are ready for CIO then, but you have to ultimately decide. See the blog label "CIO" for more. C-lee, thanks for sharing that! I am glad that worked out. I am glad to have been able to help. That is a great story to attest to the benefit of logs! Thanks! Jennifer,It sounds like he is waking out of hunger since he goes back to sleep but wakes an hour later. But you are already feeding as often as you can. I personally would give the DF another try.BUT, he could also be waking because he is too cold or too hot or has some sort of pain. So you might look into those first. Jonathan and Andrea,If you click on the blog label "dreamfeed", you will find posts taht answer your questions. Also, you can go to the "blog index" and look at the dreamfeed index, which will be easier to navigate and find what you are looking for.Most babies drop the night feedings on their own. The earliest any moms really ever try to initiate dropping night feedings is 9 weeks, but that is kind of early for most. See the "sleep problems" index for help in that area.There is a post titled "early morning feedings before waketime" that will give you ideas on that 5 AM waking.Also, keep in mind that the majority of babies naturally wake up in the 7 AM hour, and most between 7-7:30. Very few will make it to 8. So keep that in mind. Of my 3, only one was an 8 AM waker, and that happened completely by accident. I didn't plan it or initiate it. She just did it. It seems it's been a while since anyone has commented on this post so I hope you see it! I decided to post here since my baby is 5 weeks old today! Well, I just started the BabyWise routine a couple of days ago. Before this, I had created a monster! I fed on demand and sometimes this was every hour and it was exhausting! I would also nurse him to sleep and was one of those moms that slowly placed their baby in the bed hoping they were conked out enough to not wake up. I had a few questions that I couldn't find the answer to when looking through the BW book. The first couple of days were okay and his nighttime sleepings were longer than usual–until last night. After sleeping from 8:30-2:00, he woke every 2 hours(2:00,4:00,6:00, 7:15<my husband went in and held him and gave a paci and he woke at 9). I tried to wake him at 10:30 pm to feed but he would NOT wake up! His head would just bobble back and forth–my husband even tried to bottle feed hoping the milk would kind of force his way down but it would just dribble out of his mouth. So a few questions: 1. I don't have to work right now and was hoping to start his day later (9/9:30) but I am not sure if he would get in enough feedings, not to mention he doesn't like to sleep that late anyway. Do you suggest I wake him earlier to start his day? 2. I am having trouble starting his day at the same time because he has been waking up at random times each morning. So his feedings are different during the day too. When I try to get him back on schedule by trying have him last 3 hours, he acts hungry at 2.5 and acts cranky so I feed him–eventually his bedtime was an 1.5 hours off from the night before! I am a 'need to see it all broken down' person. Could you suggest a routine, including times for waketime and when would be a proper time to put him down for a nap. Leading to my next question: 3. How long should a 5 week old nap? Do I wait until he starts to get fussy to put him down? He is very content during his waketime and then when he starts the downward spiral, I put him down. This morning he woke me at 9 and I fed him, changed him and wiped his face, then tried to feed some more for the first hour, then had tummy time and then flipped him and let him look at the hang toys on his play mat. He was really content there for 40 minutes when I noticed his crankiness and put him down for a nap (10:40). He cried for a few minutes, I picked him up, rocked him, his eyes drifted close, I set him back in the crib and he fell asleep. He started whimpering about 45 minutes into it, but not awake totally. Trying to stretch out to 3 hours. I feel like his nap time is not long enough though. Also, everyone keeps telling me if I let him have all these naps during the day, he's not going to sleep at night. Is it normal for a 5 week old to take 4-6 naps a day? I am just all out of sorts. I wish I had an expert at my house telling me exactly what to do! Grr! I am sure more questions will be on here from me in the next couple weeks! Thanks! 1. Yes, I would start his day earlier. 2. see the sample schedules posts for ideas for what could be some good schedules for him. in general, you will start sometime between 7-8 AM. Then he will be up for about an hour. Then nap for 1.5-2 hours. See the posts on morning waketime for ideas on what to do about shifting morning wake up times.3. 1.5-2 hours length of naps. Then see the "optimal waketime" posts for ideas on when to put him down.the naps won't keep him up at night. Good luck! I hope you still answer posts!!! My daughter is waking up at the sometime McKenna did, 2:30-3, and then she wakes up at 6:15 on the clock! I've been giving her the paci and she goes back down for another hour, then we start our day but she doesn't really take a full feeding … would you recommend trying to wean her from the 2:30 feeding, keep what I'm doing or feed her at 6:15??? If I would do the last, how did you adjust her schedule throughout the day? What I did was feed her in the 6 am hour and then let her sleep longer for the first nap to get her back on track. So I treated the 6 feed as her first feed of the day. I have a post on early morning feedings and that can give you more options and ideas. Good luck!